A big part of the Chromecast’s allure—you know, besides its dirt-cheap $35 price tag—lies in its simplicity. All you have to do is press the big Cast button on your phone, tablet, or PC, and video starts playing on your TV. If you have a TV that supports HDMI-CEC, your Chromecast will even automatically turn the television on and switch to the correct input. On Tuesday, Google revealed not one, but two new Chromecast devices—both puck-shaped—designed to build on that sublime core experience and expand the media streamer’s usefulness into the audio realm. Both new Chromecast models pack some handy speed-and-feed tweaks. The devices support blazing-fast 802.11ac Wi-Fi now. That probably won’t matter much when you’re using streaming video services—your ISP’s speed tends to be much more of a bottleneck than your local network when it comes to Internet-based video—but it should come in handy when you’re casting browser tabs and local videos to your TV. What will come in handy for all streaming services is Chromecast’s support for both 2.4GHz and 5GHz Wi-Fi bands and a new tri-antenna system, paired with Google algorithms that always ensure you’re using the fastest available band at any given time. (Google’s OnHub router performs a similar trick.) 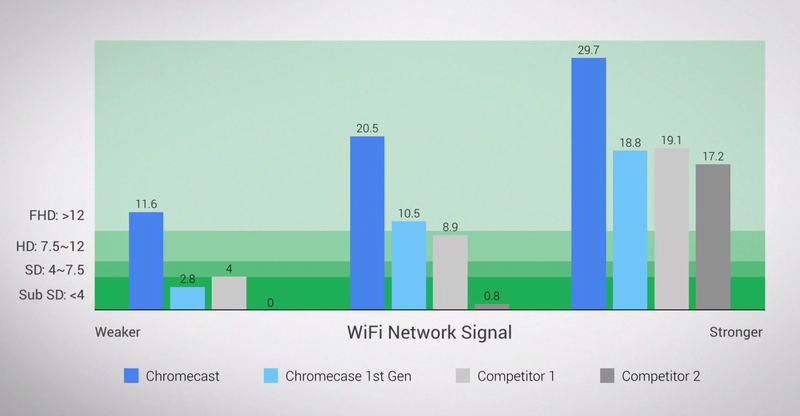 Google claims this drastically improves the Chromecast’s connection, as the above chart shows. A revamped Chromecast app joins the new Chromecast, featuring a “What’s On” tab to easily find hot content right now, a devices tab that allows any device on your home network to control the TV, and—yessssss—a new unified search option that lets you search for shows by name, then see exactly which Chromecast-supported apps offer them. A new Fast Play feature will also allow streaming services to fetch small segments of shows you’re expected to watch, largely eliminating the buffering you encounter whenever you start streaming a video. Speaking of software, Showtime is rolling out Chromecast support today, while Sling TV and apps from the NHL and NBA will embrace Google’s media streamer later this fall. You can also integrate Facebook and Flickr into Chromecast’s Backdrop screensaver mode now. 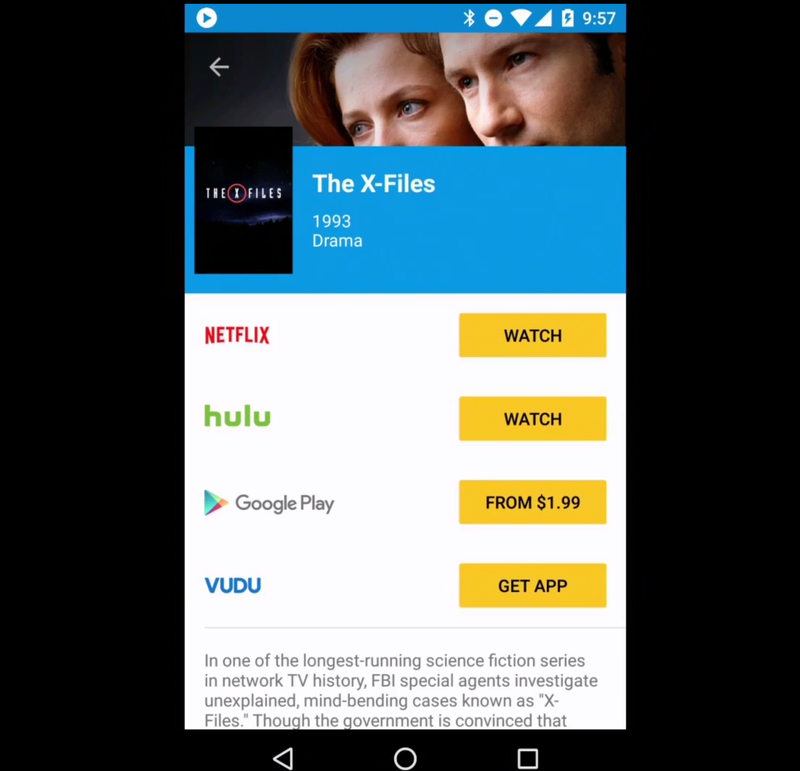 Finally, you can now use Chromecast to play Android games on your television, rocking your phone as the controller. But forget about the new Chromecast. Chromecast Audio is much more interesting. This new, music-dedicated device connects to a speaker or home audio system via a cable, and then you can Cast music from streaming music apps directly to that speaker—essentially transforming any speaker with a 3.5mm audio, RCA, or optical audio cable port into an Internet-capable device, in much the same way that the original Chromecast adds smarts to dumb TVs. Spotify is already on board with Chromecast Audio, and you can mirror existing music apps on your phone on Chromecast Audio. 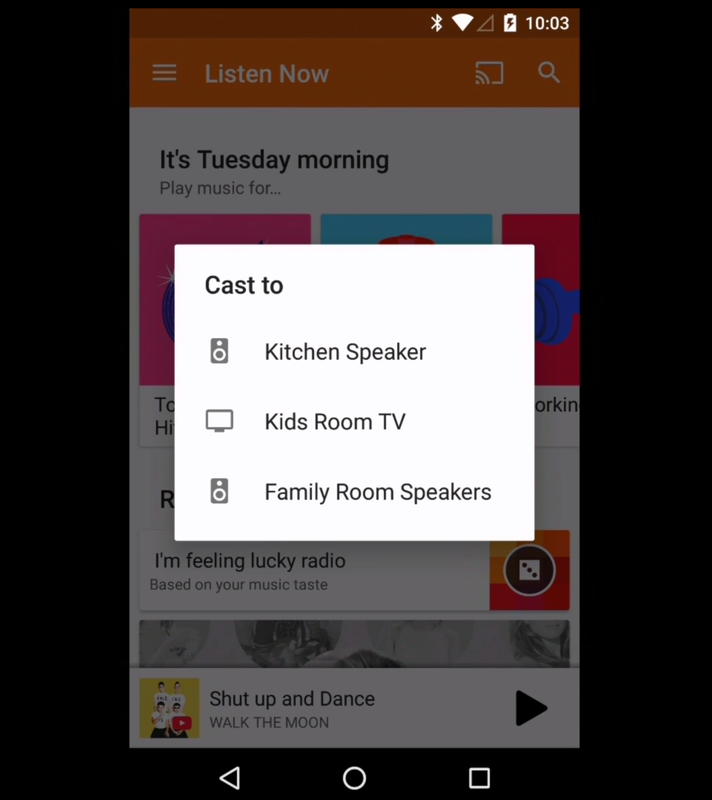 Casting music to a Chromecast Audio-connected speaker is as simple as casting video to a Chromecast-connected TV—the basic process is identical. It’ll have a guest mode in case you have pals over who you want to control the beats, but who you don’t want to have access to your Wi-Fi passwords. And an update later this fall will push out a pretty killer feature: multi-room audio sync. Be scared, Sonos. 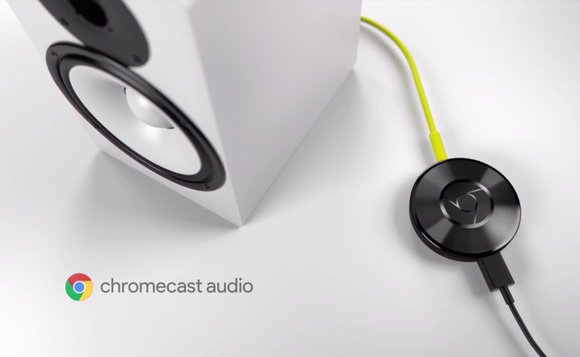 Note that Chromecast Audio is not the same as Google’s Cast for Audio program. 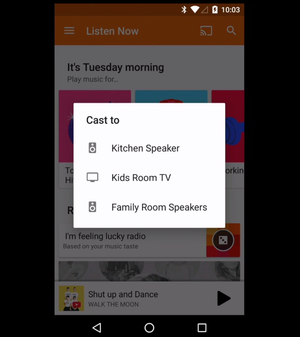 Cast for Audio is baked into Internet-connected, higher-end sound systems and speakers, which allows you to beam music directly to those speakers using Google’s Cast technology protocols. The new Chromecast Audio serves as a bridge to devices that don’t come with Cast for Audio built-in. 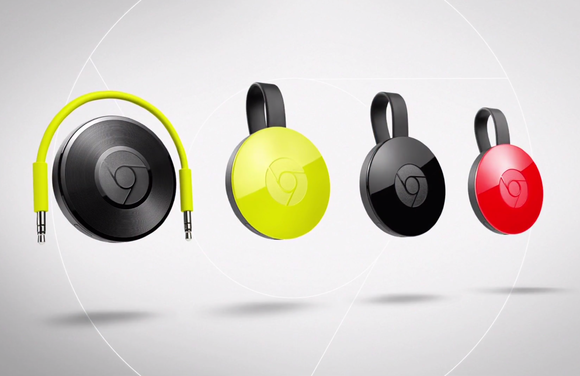 Both Chromecast devices are available today in 17 countries for $35. The new Chromecast (not Chromecast Audio) will also be available in lemonade (yellow) and coral (red) in the Play Store. The story behind the story: While Amazon’s revamped Fire TV and Nvidia’s Shield TV embrace advanced features like 4K video and game-streaming from PCs, Google’s devices skips those high-end (and thus audience-limited) options for something aimed more towards the masses. Chromecast’s newfound audio support for “dumb” devices is an exciting expansion into new-ground media streamers.